Melanoma* is the most serious type of cancer of the skin. Each year in the United States, more than 53,600 people learn they have melanoma. The National Cancer Institute (NCI) has written this booklet (NIH Publication No. 02-1563) to help people with melanoma and their families and friends better understand this disease. We hope others will read it as well to learn more about melanoma. This booklet discusses risks and prevention, symptoms, diagnosis, treatment, and followup care. It also has information about resources and sources of support to help patients cope with melanoma. Research continues to teach us more about melanoma. Scientists are learning more about its causes. They are exploring new ways to prevent, find, and treat this disease. Because of research, people with melanoma can look forward to a better quality of life and less chance of dying from this disease. Information specialists at the NCI’s Cancer Information Service at 1-800-4-CANCER can answer questions about melanoma and can send NCI materials. They can also send up-to-date treatment information from NCI’s PDQ® database. In addition, many NCI publications and fact sheets are on the Internet at http://www.cancer.gov/publications. People in the United States and its territories may use this Web site to order publications. This Web site also explains how people outside the United States can mail or fax their requests for NCI publications. *Words that may be new to readers appear in italics. The Dictionary section explains these terms. Some words in the Dictionary have a “sounds-like” spelling to show how to pronounce them. 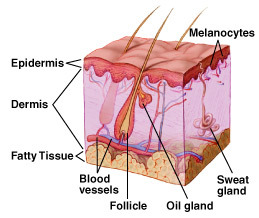 The skin has two main layers: the outer epidermis and the inner dermis. Melanoma occurs when melanocytes (pigment cells) become malignant. Most pigment cells are in the skin; when melanoma starts in the skin, the disease is called cutaneous melanoma. Melanoma may also occur in the eye (ocular melanoma or intraocular melanoma). Rarely, melanoma may arise in the meninges, the digestive tract, lymph nodes, or other areas where melanocytes are found. Melanomas that begin in areas other than the skin are not discussed in this booklet. The Cancer Information Service (1-800-4-CANCER) can provide information about these types of melanoma. Melanoma is one of the most common cancers. The chance of developing it increases with age, but this disease affects people of all ages. It can occur on any skin surface. In men, melanoma is often found on the trunk (the area between the shoulders and the hips) or the head and neck. In women, it often develops on the lower legs. Melanoma is rare in black people and others with dark skin. When it does develop in dark-skinned people, it tends to occur under the fingernails or toenails, or on the palms or soles. No one knows the exact causes of melanoma. Doctors can seldom explain why one person gets melanoma and another does not. However, research has shown that people with certain risk factors are more likely than others to develop melanoma. A risk factor is anything that increases a person’s chance of developing a disease. Still, many who do get this disease have no known risk factors. Dysplastic nevi: Dysplastic nevi are more likely than ordinary moles to become cancerous. Dysplastic nevi are common, and many people have a few of these abnormal moles. The risk of melanoma is greatest for people who have a large number of dysplastic nevi. The risk is especially high for people with a family history of both dysplastic nevi and melanoma. Many (more than 50) ordinary moles: Having many moles increases the risk of developing melanoma. Fair skin: Melanoma occurs more frequently in people who have fair skin that burns or freckles easily (these people also usually have red or blond hair and blue eyes) than in people with dark skin. White people get melanoma far more often than do black people, probably because light skin is more easily damaged by the sun. Personal history of melanoma or skin cancer: People who have been treated for melanoma have a high risk of a second melanoma. Some people develop more than two melanomas. People who had one or more of the common skin cancers (basal cell carcinoma or squamous cell carcinoma) are at increased risk of melanoma. Family history of melanoma: Melanoma sometimes runs in families. Having two or more close relatives who have had this disease is a risk factor. About 10 percent of all patients with melanoma have a family member with this disease. When melanoma runs in a family, all family members should be checked regularly by a doctor. Weakened immune system: People whose immune system is weakened by certain cancers, by drugs given following organ transplantation, or by HIV are at increased risk of developing melanoma. Severe, blistering sunburns: People who have had at least one severe, blistering sunburn as a child or teenager are at increased risk of melanoma. Because of this, doctors advise that parents protect children’s skin from the sun. Such protection may reduce the risk of melanoma later in life. Sunburns in adulthood are also a risk factor for melanoma. Ultraviolet (UV) radiation: Experts believe that much of the worldwide increase in melanoma is related to an increase in the amount of time people spend in the sun. This disease is also more common in people who live in areas that get large amounts of UV radiation from the sun. In the United States, for example, melanoma is more common in Texas than in Minnesota, where the sun is not as strong. UV radiation from the sun causes premature aging of the skin and skin damage that can lead to melanoma. Artificial sources of UV radiation, such as sunlamps and tanning booths, also can cause skin damage and increase the risk of melanoma. Doctors encourage people to limit their exposure to natural UV radiation and to avoid artificial sources. Avoid exposure to the midday sun (from 10 a.m. to 4 p.m.) whenever possible. When your shadow is shorter than you are, remember to protect yourself from the sun. If you must be outside, wear long sleeves, long pants, and a hat with a wide brim. Protect yourself from UV radiation that can penetrate light clothing, windshields, and windows. Protect yourself from UV radiation reflected by sand, water, snow, and ice. Help protect your skin by using a lotion, cream, or gel that contains sunscreen. Many doctors believe sunscreens may help prevent melanoma, especially sunscreens that reflect, absorb, and/or scatter both types of ultraviolet radiation. These sunscreen products will be labeled with “broad-spectrum coverage.” Sunscreens are rated in strength according to a sun protection factor (SPF). The higher the SPF, the more sunburn protection is provided. Sunscreens with an SPF value of 2 to 11 provide minimal protection against sunburns. Sunscreens with an SPF of 12 to 29 provide moderate protection. Those with an SPF of 30 or higher provide the most protection against sunburn. Wear sunglasses that have UV-absorbing lenses. The label should specify that the lenses block at least 99 percent of UVA and UVB radiation. Sunglasses can protect both the eyes and the skin around the eyes. People who are concerned about developing melanoma should talk with their doctor about the disease, the symptoms to watch for, and an appropriate schedule for checkups. The doctor’s advice will be based on the person’s personal and family history, medical history, and other risk factors. If you have a question or concern about something on your skin, see your doctor. Do not use the following pictures to try to diagnose it yourself. Pictures are useful examples, but they cannot take the place of a doctor’s examination. Asymmetry—The shape of one half does not match the other. Border—The edges are often ragged, notched, blurred, or irregular in outline; the pigment may spread into the surrounding skin. Color—The color is uneven. Shades of black, brown, and tan may be present. Areas of white, grey, red, pink, or blue also may be seen. Diameter—There is a change in size, usually an increase. Melanomas are usually larger than the eraser of a pencil (1/4 inch or 5 millimeters). Melanomas can vary greatly in how they look. Many show all of the ABCD features. However, some may show changes or abnormalities in only one or two of the ABCD features. Melanomas in an early stage may be found when an existing mole changes slightly, for example, when a new black area forms. Newly formed fine scales and itching in a mole also are common symptoms of early melanoma. In more advanced melanoma, the texture of the mole may change. For example, it may become hard or lumpy. Melanomas may feel different from regular moles. More advanced tumors may itch, ooze, or bleed. But melanomas usually do not cause pain. A skin examination is often part of a routine checkup by a health care provider. People also can check their own skin for new growths or other changes. (The “How To Do a Skin Self-Exam” section has a simple guide on how to do this skin self-exam.) Changes in the skin, such as a change in a mole, should be reported to the health care provider right away. The person may be referred to a dermatologist, a doctor who specializes in diseases of the skin. Melanoma can be cured if it is diagnosed and treated when the tumor is thin and has not deeply invaded the skin. However, if a melanoma is not removed at its early stages, cancer cells may grow downward from the skin surface and invade healthy tissue. When a melanoma becomes thick and deep, the disease often spreads to other parts of the body and is difficult to control. Dysplastic nevi often look very much like melanoma. Doctors with special training in skin diseases are in the best position to decide whether an abnormal-looking mole should be closely watched or removed and checked for cancer. In some families, many members have a large number of dysplastic nevi, and some have had melanoma. Members of these families have a very high risk of melanoma. Doctors often recommend that they have frequent checkups (every 3 to 6 months) so that any problems can be detected early. The doctor may take pictures of a person’s skin to help show when changes occur. How long will it take? Will it hurt? Will the entire tumor be removed? The doctor can describe treatment choices and discuss the results expected with each treatment option. The doctor and patient can work together to develop a treatment plan that fits the patient’s needs. Treatment for melanoma depends on the extent of the disease, the patient’s age and general health, and other factors. People with melanoma are often treated by a team of specialists. The team may include a dermatologist, surgeon, medical oncologist, radiation oncologist, and plastic surgeon. Before starting treatment, the patient might want a second opinion about the diagnosis and the treatment plan. Some insurance companies require a second opinion; others may cover a second opinion if the patient or doctor requests it. The Cancer Information Service, at 1-800-4-CANCER, can tell callers about nearby treatment centers.A local or state medical society, a nearby hospital, or a medical school can usually provide the names of specialists. People with melanoma often want to take an active part in making decisions about their medical care. They want to learn all they can about their disease and their treatment choices. However, shock and stress after a diagnosis of a melanoma can make it hard to think of everything to ask the doctor. It often helps to make a list of questions before an appointment. To help remember what the doctor says, patients may take notes or ask whether they may use a tape recorder. Some also want to have a family member or friend with them when they talk to the doctor—to take part in the discussion, to take notes, or just to listen. Would a clinical trial (research study) be appropriate for me? Can you help me find one? People do not need to ask all of their questions or understand all of the answers at one time. They will have other chances to ask the doctor to explain things that are not clear and to ask for more information. People with melanoma may have surgery, chemotherapy, biological therapy, or radiation therapy. Patients may have a combination of treatments. At any stage of disease, people with melanoma may have treatment to control pain and other symptoms of the cancer, to relieve the side effects of therapy, and to ease emotional and practical problems. This kind of treatment is called symptom management, supportive care, or palliative care. The doctor is the best person to describe the treatment choices and discuss the expected results. A patient may want to talk to the doctor about taking part in a clinical trial, a research study of new treatment methods. The section on “The Promise of Cancer Research” has more information about clinical trials. The doctor may be able to completely remove a very thin melanoma during the biopsy. Further surgery may not be necessary. If the melanoma was not completely removed during the biopsy, the doctor takes out the remaining tumor. In most cases, additional surgery is performed to remove normal-looking tissue around the tumor (called the margin) to make sure all melanoma cells are removed. This is often necessary, even for thin melanomas. If the melanoma is thick, the doctor may need to remove a larger margin of tissue. If a large area of tissue is removed, the surgeon may do a skin graft. For this procedure, the doctor uses skin from another part of the body to replace the skin that was removed. Sentinel lymph node biopsy—The sentinel lymph node biopsy is done after the biopsy of the melanoma but before the wider excision of the tumor. 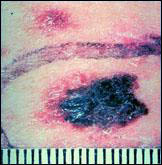 A radioactive substance is injected near the melanoma. The surgeon follows the movement of the substance on a computer screen. The first lymph node(s) to take up the substance is called the sentinel lymph node(s). (The imaging study is called lymphoscintigraphy. The procedure to identify the sentinel node(s) is called sentinel lymph node mapping.) The surgeon removes the sentinel node(s) to check for cancer cells.If a sentinel node contains cancer cells, the surgeon removes the rest of the lymph nodes in the area. However, if a sentinel node does not contain cancer cells, no additional lymph nodes are removed. Lymph node dissection—The surgeon removes all the lymph nodes in the area of the melanoma. Therapy may be given after surgery to kill cancer cells that remain in the body. This treatment is called adjuvant therapy. The patient may receive biological therapy. Surgery is generally not effective in controlling melanoma that has spread to other parts of the body. In such cases, doctors may use other methods of treatment, such as chemotherapy, biological therapy, radiation therapy, or a combination of these methods. Chemotherapy, the use of drugs to kill cancer cells, is sometimes used to treat melanoma. The drugs are usually given in cycles: a treatment period followed by a recovery period, then another treatment period, and so on. Usually a patient has chemotherapy as an outpatient (at the hospital, at the doctor’s office, or at home). However, depending on which drugs are given and the patient’s general health, a short hospital stay may be needed. By mouth or injection—Either way, the drugs enter the bloodstream and travel throughout the body. Isolated limb perfusion(also called isolated arterial perfusion)—For melanoma on an arm or leg, chemotherapy drugs are put directly into the bloodstream of that limb. The flow of blood to and from the limb is stopped for a while. This allows most of the drug to reach the tumor directly. Most of the chemotherapy remains in that limb.The drugs may be heated before injection. This type of chemotherapy is called hyperthermic perfusion. Biological therapy (also called immunotherapy) is a form of treatment that uses the body’s immune system, either directly or indirectly, to fight cancer or to reduce side effects caused by some cancer treatments. Biological therapy for melanoma uses substances called cytokines. The body normally produces cytokines in small amounts in response to infections and other diseases. Using modern laboratory techniques, scientists can produce cytokines in large amounts. In some cases, biological therapy given after surgery can help prevent melanoma from recurring. For patients with metastatic melanoma or a high risk of recurrence, interferon alpha and interleukin-2 (also called IL-2 or aldesleukin) may be recommended after surgery. Radiation therapy (also called radiotherapy) uses high-energy rays to kill cancer cells. A large machine directs radiation at the body. The patient usually has treatment at a hospital or clinic, five days a week for several weeks. Radiation therapy may be used to help control melanoma that has spread to the brain, bones, and other parts of the body. It may shrink the tumor and relieve symptoms. People with Stage 0 melanoma may have minor surgery to remove the tumor and some of the surrounding tissue. People with Stage I melanoma may have surgery to remove the tumor. The surgeon may also remove as much as 2 centimeters (3/4 inch) of tissue around the tumor. To cover the wound, the patient may have skin grafting. People with Stage II or Stage III melanoma may have surgery to remove the tumor. The surgeon may also remove as much as 3 centimeters (1 1/4 inches) of nearby tissue. Skin grafting may be done to cover the wound. Sometimes the surgeon removes nearby lymph nodes. People with Stage IV melanoma often receive palliative care. The goal of palliative care is to help the patient feel better—physically and emotionally. This type of treatment is intended to control pain and other symptoms and to relieve the side effects of therapy (such as nausea), rather than to extend life. People with advanced melanoma can find helpful information in the National Cancer Institute booklet Pain Control. Treatment for recurrent melanoma depends on where the cancer came back, which treatments the patient has already received, and other factors. As with Stage IV melanoma, treatment usually cannot cure melanoma that recurs. Palliative care is often an important part of the treatment plan. Many patients have palliative care to ease their symptoms while they are getting anticancer treatments to slow the progress of the disease. Some receive only palliative care to improve their quality of life by easing pain, nausea, and other symptoms. Because treatment may damage healthy cells and tissues, unwanted side effects sometimes occur. These side effects depend on many factors, including the location of the tumor and the type and extent of the treatment. Side effects may not be the same for each person, and they may even change from one treatment session to the next. Before treatment starts, the health care team will explain possible side effects and suggest ways to help the patient manage them. The NCI provides helpful booklets about cancer treatments and coping with side effects, such as Radiation Therapy and You, Chemotherapy and You, and Eating Hints. See the sections “National Cancer Institute Information Resources” and “National Cancer Institute Booklets” for other sources of information about side effects. The side effects of surgery depend mainly on the size and location of the tumor and the extent of the operation. Although patients may have some pain during the first few days after surgery, this pain can be controlled with medicine. People should feel free to discuss pain relief with the doctor or nurse. It is also common for patients to feel tired or weak for a while. The length of time it takes to recover from an operation varies for each patient. Scarring may also be a concern for some patients. To avoid causing large scars, doctors remove as little tissue as they can (while still protecting against recurrence). In general, the scar from surgery to remove an early stage melanoma is a small line (often 1 to 2 inches long), and it fades with time. How noticeable the scar is depends on where the melanoma was, how well the person heals, and whether the person develops raised scars called keloids. When a tumor is large and thick, the doctor must remove more surrounding skin and other tissue (including muscle). Although skin grafts reduce scarring caused by the removal of large growths, these scars will still be quite noticeable. Surgery to remove the lymph nodes from the underarm or groin may damage the lymphatic system and slow the flow of lymphatic fluid in the arm or leg. Lymphatic fluid may build up in a limb and cause swelling (lymphedema). The doctor or nurse can suggest exercises or other ways to reduce swelling if it becomes a problem. Also, it is harder for the body to fight infection in a limb after nearby lymph nodes have been removed, so the patient will need to protect the arm or leg from cuts, scratches, bruises, insect bites, or burns that may lead to infection. If an infection does develop, the patient should see the doctor right away. Cells in hair roots: Chemotherapy can lead to hair loss. The hair grows back, but the new hair may be somewhat different in color and texture. The side effects of biological therapy vary with the type of treatment. These treatments may cause flu-like symptoms, such as chills, fever, muscle aches, weakness, loss of appetite, nausea, vomiting, and diarrhea. Patients may also get a skin rash. These problems can be severe, but they go away after treatment stops. The side effects of radiation therapy depend on the amount of radiation given and the area being treated. Side effects that may occur in the treated area include red or dry skin and hair loss. Radiation therapy also may cause fatigue. Although the side effects of radiation therapy can be unpleasant, the doctor can usually treat or control them. It also helps to know that, in most cases, side effects are not permanent. People with melanoma may not feel like eating, especially if they are uncomfortable or tired. Also, the side effects of treatment, such as poor appetite, nausea, or vomiting, can be a problem. Foods may taste different. Nevertheless, patients should try to eat well during cancer therapy. They need enough calories to maintain a good weight and protein to keep up strength. Good nutrition often helps people with cancer feel better and have more energy. The doctor, dietitian, or other health care provider can suggest ways to maintain a healthy diet. Patients and their families may want to read the National Cancer Institute booklet Eating Hints, which contains many useful ideas and recipes. The “National Cancer Institute Booklets” section tells how to get this publication. Melanoma patients have a high risk of developing new melanomas. Some also are at risk of a recurrence of the original melanoma in nearby skin or in other parts of the body. To increase the chance of detecting a new or recurrent melanoma as early as possible, patients should follow their doctor’s schedule for regular checkups. It is especially important for patients who have dysplastic nevi and a family history of melanoma to have frequent checkups. Patients also should examine their skin monthly (keeping in mind the “ABCD” guidelines in the “Signs and Symptoms” section, and the skin self-exam described in “How To Do a Skin Self-Exam”). They should follow their doctor’s advice about how to reduce their chance of developing another melanoma. General information about reducing the risk of melanoma is described in the “Melanoma: Who’s at Risk?” section. The chance of recurrence is greater for patients whose melanoma was thick or had spread to nearby tissue than for patients with very thin melanomas. Followup care for those who have a high risk of recurrence may include x-rays, blood tests, and scans of the chest, liver, bones, and brain. The NCI has prepared a booklet for people who have completed their treatment to help answer questions about followup care and other concerns. Facing Forward Series: Life After Cancer Treatment provides tips for getting the most out of medical visits. It describes the kinds of help people may need. Are my family members at risk of melanoma? Should they schedule an appointment with their doctor for an examination? The Cancer Information Service at 1-800-4-CANCER can send publications and provide information to help patients and their families locate programs and services. Doctors all over the country are conducting many types of clinical trials. These are research studies in which people take part voluntarily. Studies include new ways to treat melanomas. Research already has led to advances, and researchers continue to search for more effective approaches. Patients who join these studies have the first chance to benefit from treatments that have shown promise in earlier research. They also make an important contribution to medical science by helping doctors learn more about the disease. Although clinical trials may pose some risks, researchers take very careful steps to protect their patients. Researchers are testing new anticancer drugs. They are looking at combining chemotherapy with radiation therapy. Other studies are combining chemotherapy with biological therapy. Scientists also are studying several cancer vaccines and a type of gene therapy designed to help the immune system kill cancer cells. Patients who are interested in being part of a clinical trial should talk with their doctor. They may want to read the NCI booklet Taking Part in Cancer Treatment Research Studies. It explains how clinical trials are carried out and explains their possible benefits and risks. NCI’s Web site includes a section on clinical trials at http://www.cancer.gov/clinicaltrials. This section of the Web site provides general information about clinical trials. It also offers detailed information about ongoing studies of melanoma treatment by linking to PDQ®, a cancer information database developed by the NCI. The Cancer Information Service at 1-800-4-CANCER can answer questions and provide information from the PDQ database. Your doctor or nurse may recommend that you do a regular skin self-exam. If your doctor has taken photos of your skin, comparing your skin to the photos can help you check for changes. The best time to do a skin self-exam is after a shower or bath. You should check your skin in a well-lighted room using a full-length mirror and a hand-held mirror. It’s best to begin by learning where your birthmarks, moles, and blemishes are and what they usually look and feel like. Check yourself from head to toe. Don’t forget to check all areas of the skin, including the back, the scalp, between the buttocks, and the genital area. Look at your face, neck, ears, and scalp. You may want to use a comb or a blow dryer to move your hair so that you can see better. You also may want to have a relative or friend check through your hair because this is difficult to do yourself. Examine the back, front, and sides of your legs. Also look between your buttocks and around your genital area. By checking your skin regularly, you will become familiar with what is normal for you. It may be helpful to record the dates of your skin exams and to write notes about the way your skin looks. If you find anything unusual, see your doctor right away. National Cancer Institute (NCI) publications can be ordered by writing to the address below, and some can be viewed and downloaded from http://www.cancer.gov/publications on the Internet. In addition, people in the United States and its territories may order these and other NCI booklets by calling the Cancer Information Service at 1-800-4-CANCER. They may also order many NCI publications on-line at http://www.cancer.gov/publications. You may want more information for yourself, your family, and your doctor. The NCI offers comprehensive research-based information for patients and their families, health professionals, cancer researchers, advocates, and the public.